Are you the inquisitive type? Well the speculum is the toy for you! You can use this toy to do spot inspections or to help stretch to insert another toy. 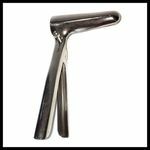 Each speculum is smooth stainless steel, helping with the entry.